Leah suggested we might want to do something small today. I decided to take my background I created a few days ago and scan it. I am not sure I want to commit anything permanently to it, yet. 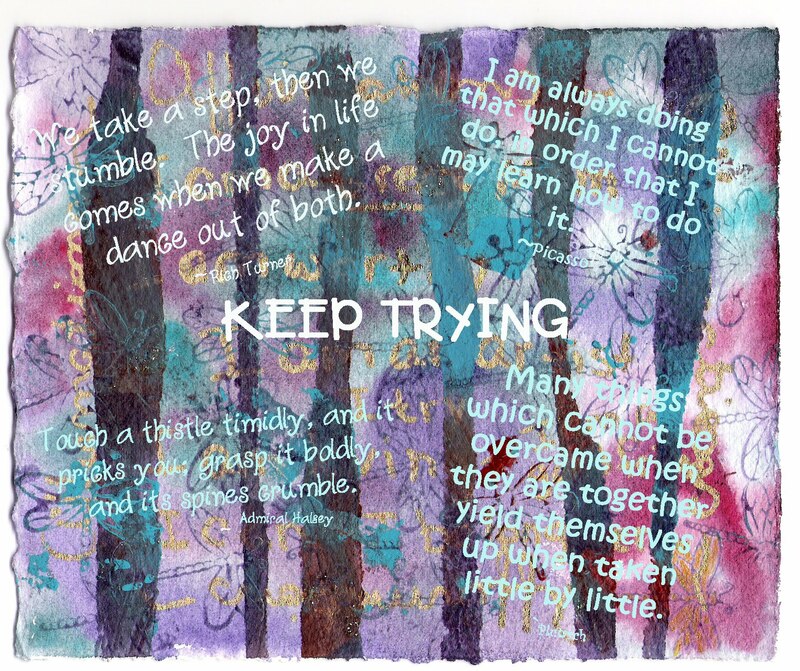 So I added some quotes after scanning that I think go along with Leah's message today about hanging in there (to paraphrase). I printed it out and have it hanging in my creative space. I do want to collage on the original, but I am searching for just the right images for what I want it to say to me. Happy creating! 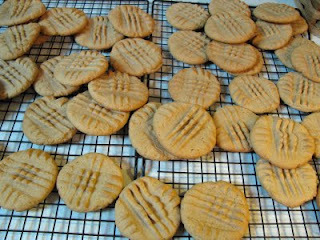 I also made peanut butter cookies and that was pretty creative for me, lol. They are for my grownup son's bday--his favorite. Thanks to everyone for the supportive comments as you visit my blog. 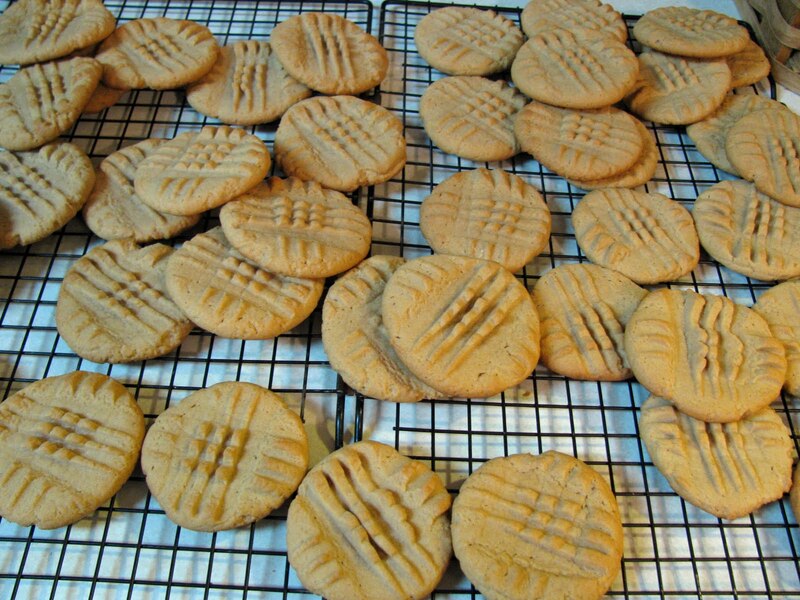 Oh, the cookies look delicious! Yum yum the cookies look delicious... and I love the background for the collage. That is a really beautiful background!!! and can I have a cookie please???? 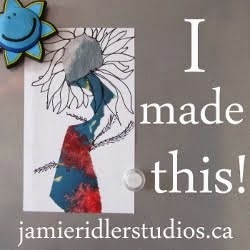 Thanks so much for the kind words at my blog! Have fun with your journal. what a supportive image to hang in your space! Maybe I need to get your recipe---mine always crumble and look pathetic. And could you share instructions for the paper bag album? It looks very interesting. What a brilliant combination... cookies AND a gorgeous background AND inspirational quotes. You are a fabulous composer. Oh man, now I want a cookie! 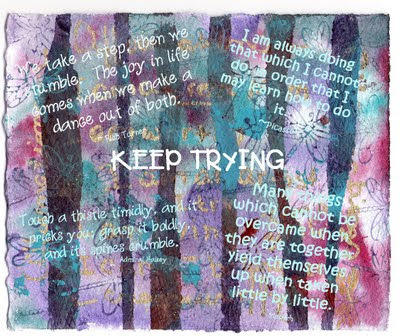 I like the "Keep Trying" in the middle of your art. It is a simple and poignant message. I appreciate seeing your comments on my and other AEDM participants blogs...you are so nurturing and kind! Yes, I agree with the cookie comments. They do look yummy. And your inspirational messages go perfectly with your beautiful background. Love the colors.